Nouvelle Fusion Kitchen & Bar takes centre stage at SCAPE as an edgy fusion restaurant with signature tapas conveyor belt. It is uncommon to see anything other than sushi on conveyor belts, and Nouvelle Fusion Kitchen & Bar sure wins for novelty. This very modern restaurant boasts a funky interior with colourful neon lights. The spacious cushioned booth seats make it very intimate and comfortable to hang out at, and ordering is made convenient with e-menus via iPad. 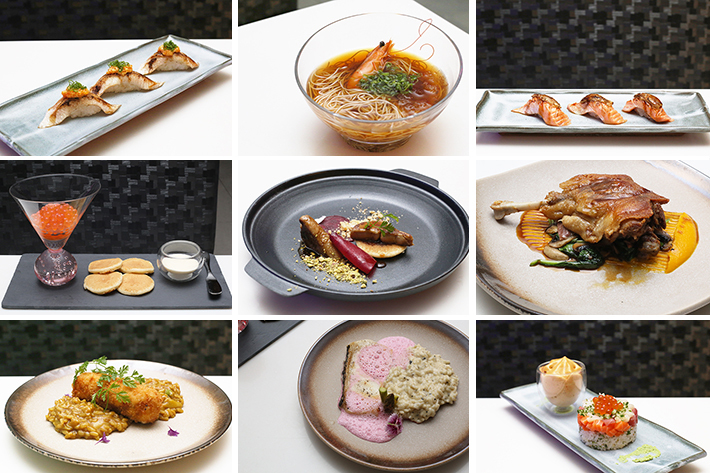 Here’s other tidbit – the fusion tapas conveyor belt items are all at a flat price of S$1.50 per plate. Besides tapas, Nouvelle Fusion Kitchen & Bar also serves classy fusion mains with equally reasonable price tags. Think risotto, duck confit and so much more. Nouvelle Fusion Kitchen & Bar is surely a new restaurant in Singapore to love and check out in 2016. The belts are lighted up with colour-changing neon lights; very fun, very trendy. And the selections on the conveyor belt will not “disappoint you” with the usual options of sushi and sashimi; instead, expect unique creations and interesting tapas that feature both Asian and Western ingredients. Some of our favourite tapas items were Duck Rillette Tartlet, Mushroom Tartlets with Feta Cheese, Salmon Tartlet and Iberico Ham with Fresh Melon. 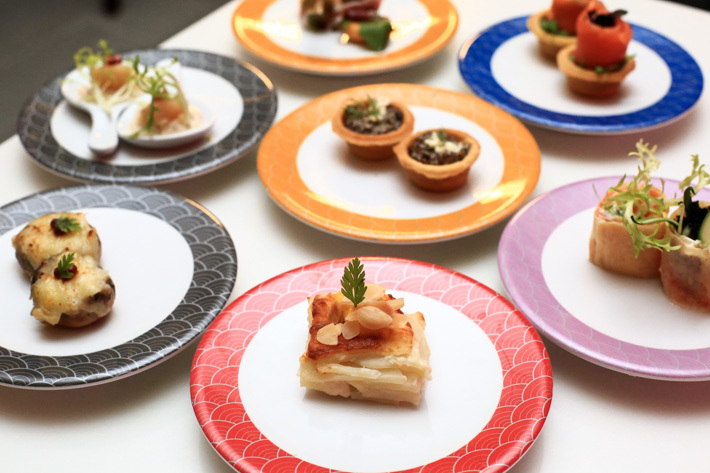 All these bite sized treats are priced at S$1.50 per plate – regardless of what they are! This is not a fusion restaurant without sushi; you still get your Japanese food fix, in unconventional ways. The King Salmon Belly Aburi with foie gras (S$4 each) was to die for. Everything just melts in your mouth; delightful to say the least. It is one of those one-bite-wonders that really hits the spot, and you bet everyone at the table went gaga over it. Another contender (especially for those who do not take salmon) was the Hamachi Belly Aburi (S$4 each). Torched and slightly fatty, this winter fish sashimi is less fishy and easier to eat for all of you who are not huge fans of raw fish. Hamachi is Japanese amberjack, or more commonly known as yellowtail tuna. We had both the Matcha Miruku (S$13) and the Iced Lemon Tea (S$7). And of course, being huge fans of matcha latte, the former worked better for us. The matcha did not reek of the generic processed taste and was a very pleasant drink alongside the dishes at Nouvelle Fusion Kitchen & Bar. The mains here really surprised us as we did not think that the mains could top the tapas dishes. The Ikura with Blinis (S$10) – was a surprising hit with everyone. The ikura (salmon roe) was generous and the mini blinis really balanced out the saltiness of the roe. The portion is also just right for sharing. There was something about the perfectly cooked soba noodles that was simple but so refreshing; this dish of Cold Yuzu Somen (S$8) is good for days where you prefer light meals. We know foie gras is not for everyone, but we have to point out that Nouvelle Fusion Kitchen & Bar’s rendition is our idea of temptation. The price is not only reasonable, this Miso Foie Gras (S$14) was beautifully pan-fried and the presentation is the cherry on top. Chirashi-don is not hard to find, but at Nouvelle, we have the Chirashi Tartare (S$12). Essentially diced sashimi atop sushi rice, this presentation is ingenious. It is served with Yuzu/Shoyu foam on the side (which also comes as an add-on version for the sashimi platters), and this dish has redefined how chirashi-don can be enjoyed. On to the main stars, which are the risottos; you’d be surprised by the renditions. The Truffle Cod Risotto (S$22) was stunning. Every grained was cooked to perfection with a lovely truffle aroma, and the cod comes in a substantial portion that makes the dish so value-for-money. The Curry Chicken Risotto (S$18) sure wowed us for its creativity and brilliant layers of flavours. The chicken was made into a roulade with ham and cheese, then battered and deep-fried to a golden brown. Served on top of a bed of tasty curry risotto rice, which strangely reminded us of the Singaporean-style curry chicken rice, this risotto is one hearty and homely dish with a unique twist. 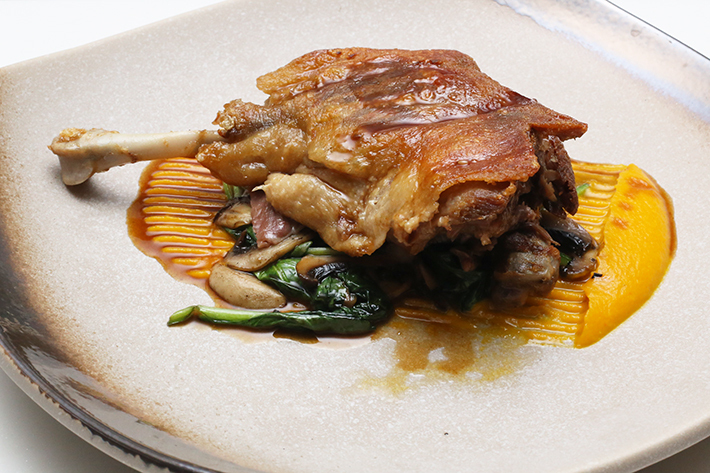 From the crisp skin to the tender meat inside, Nouvelle’s Duck Confit (S$22) is one of those dishes that will totally keep us coming back for. This Matcha Fantasy (S$8) is such an adorable dessert dish that we can’t help falling in love with. Well, matcha anything always works for us, and the mini ‘watermelon’ mochi on the top only added to the likability of the dish. For the latest updates, go to www.nouvellefoodconcepts.com, and like Nouvelle on Facebook and Instagram. This post is brought to you by Nouvelle Fusion Kitchen & Bar. I went there today and was very disappointed. Two thumbs down for me ???? You might wan to remove your name from this restaurant, all the photos are FAKE. Food taste so plain, from the way the food is serve you can even taste microwave frozen food. Beware: the sashimi have no taste of freshness, texture is like a very dry piece of ice, cut unprofessionally. no plating, frozen, slice by a ??? (definitely not a chef or cook), and anyhow throw onto empty plate and served. -1 very thin cheese (1cm by 0.5cm by 0.1cm thick) on top of mash tapioca with no seasoning, on top a brown mushroom soaked in ice water. each serving measusre 2cm by 1.5cm by 1.5cm thick. -tasting: cheese and tapioca is totally dry and tasteless, when bite into it the mushroom bust out cold plain water like it had just been soaked in ice water before serving. -(1/4 the size of a KFC egg tart) with nearly no topping, burnt outside, no seasoning, and bite into a piece of ice. taste: split out onto the plate. cant even swallow. If you think i am lying, go and waste your money on it. See and taste for yourselves.